We’d run out of clean clothes and needed to do some washing. It was time to go and visit some family. 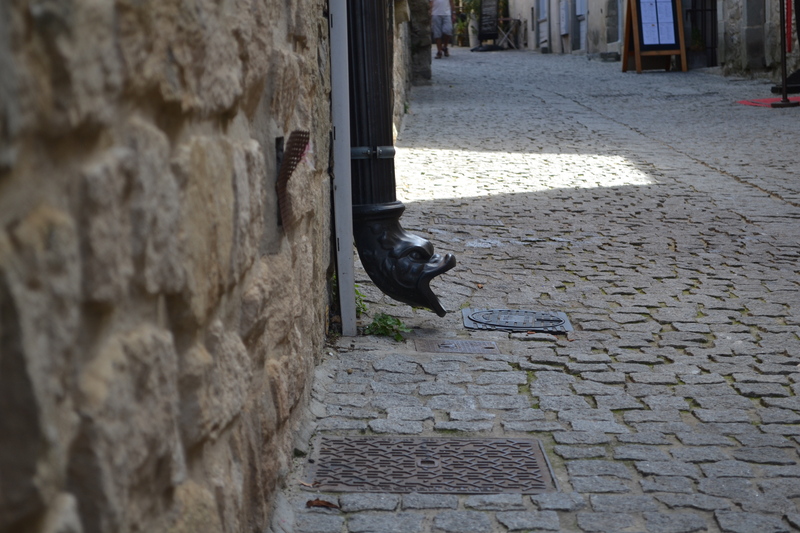 My aunt and uncle had fairly recently moved to the village of Moux, in the south of France. B and I were originally planning to try fit another couple of towns in between Zaragoza and Moux, but in the end decided we had had enough of hotels for a few days and to do the trip in one go. So after the standard morning coffee, off we went. The journey was fairly uneventful except for one point so notably bad as to be worth a mention: Le Perthus. Le Perthus is a small town which sits half in Spain and half in France. The Spanish side of town sells almost exclusively bad alcohol and tobacco (which is much cheaper in Spain than France), the remaining space appeared to be mostly brothels and casinos, and the whole place is overrun with the type of people willing to drive a long way to lose money in such places. Snap-button track pants were still the height of fashion. It is literally the worst place either of us had ever visited, but at least leads to a helpful travel hint: avoid Le Perthus at all costs. Mildly scarred, we made it to Moux fairly late and a little lost (our GPS refused to acknowledge that the street we were looking for was real, despite it having been in existence for several hundred years) but just in time for dinner. My uncle is a wonderful cook, and we were treated to some beautiful food (and wine) every day during our stay. Another of my uncles, this one from Wellington, also just happened to be staying at the same time as us, and so we spent a nice evening catching up before hitting the sack. It rained torrentially much of the day (there was flooding in some neighbouring villages) and there were some spectacular thunderstorms. We needed a rest day, and so rest is what we did. I don’t think we moved more than about 10m from bed all day, so there is really not that much to write about from our first day in Moux. The next morning the weather was back to being perfect, so after a neighbour lent B and I a bike each for the day we set off for a cruise in the countryside. We had brunch in one of the small villages we passed through, and eventually came across one of the canals which run all across France. 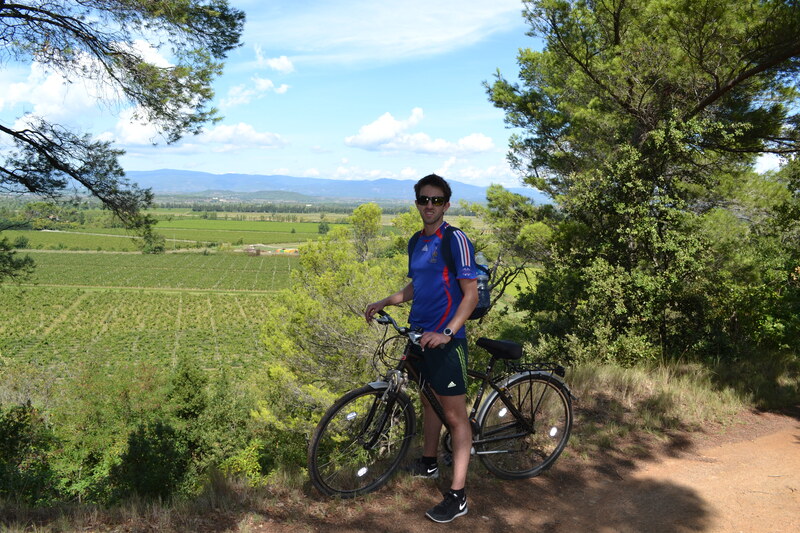 The canal was great: surrounded by fields and vineyards, it had a nice little bike path along the side, and every couple of kilometres it would pass another series of locks (pools to raise or drop the canal boats between levels) with a queue of boats waiting to use it. 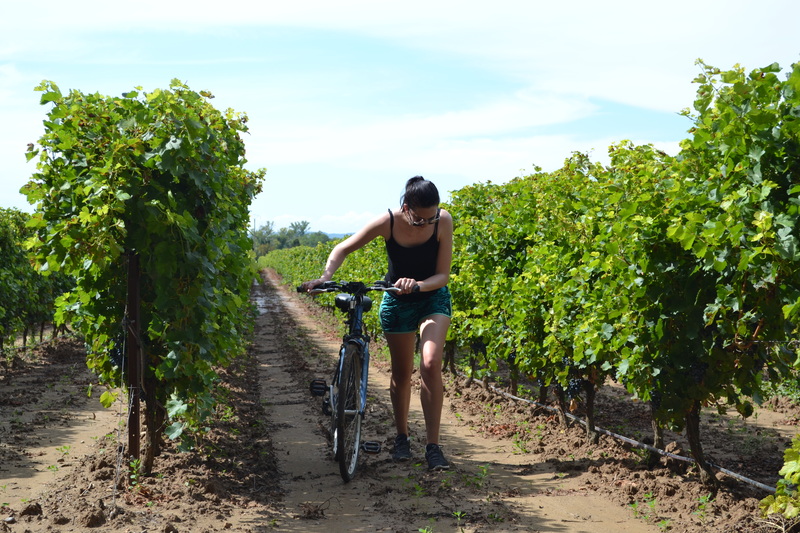 We cycled down for an hour or so to a village where we had intended to have lunch, but as we got there a little late for lunch we had to make do with a glass of liquid grapes for sustenance before heading home. After lunch I got my first haircut since coming to Europe. With my aunt to translate, I asked for a standard number 4 comb all over, which seemed to be understood, and then sat down. Apparently a little was lost in translation, since almost all of the hair on the sides of my head fell off and almost all on the top remained, but the end result looked alright regardless so off we went for another delicious dinner with the family. 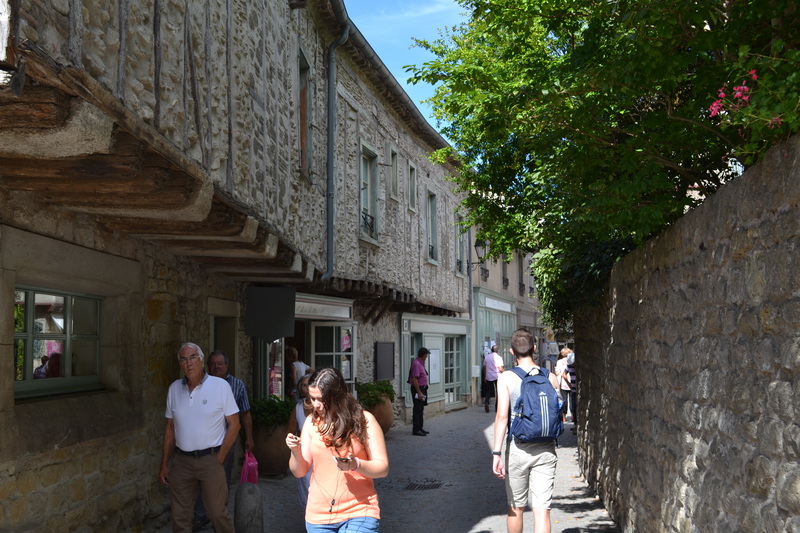 We started off the third day with a trip to a local French marketplace. B and I were sort of expecting a NZ-style farmers market – mostly home-made food, maybe some plants and wine – but this was different in that it sold absolutely everything. Food and clothes were the main focus, but you could also pick yourself up an iPhone (which may have even been genuine), buy some soap, even take your knives down to have them sharpened (which my uncle does). We settled for some pastries for then and some artichokes for later. For lunch my aunt and uncle took us to experience a traditional French lunch at another local village. Uncle told us a story about how, when they first arrived in France a number of years ago, such a lunch would come accompanied by a litre or so of wine as standard – per person! Crazy. B and I both had the set menu for the day, for about 11 euro: a tuna salad to start (which would have been a meal in itself), a huge plate of beans, sausage, pork steak and pork belly for the main, and then a generous slice of apple pie for dessert. I failed to make it through the main, and B had stumbled before the end of the starter – these meals were just huge – which the locals seemed to find a bit funny. All of it was delicious, but if that was my regular lunch I’d be both the size of an American and very unproductive with my afternoons. 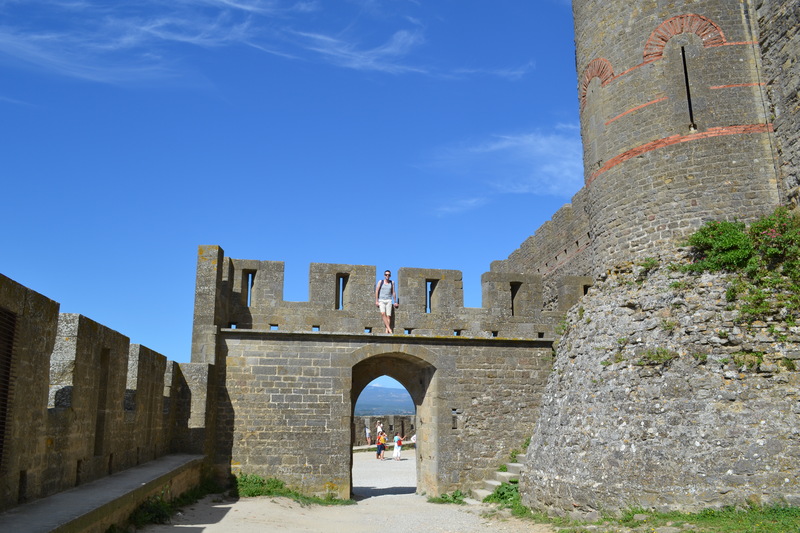 We had to be productive that day though, because we were off to do some sightseeing: Carcassonne and Lastours. 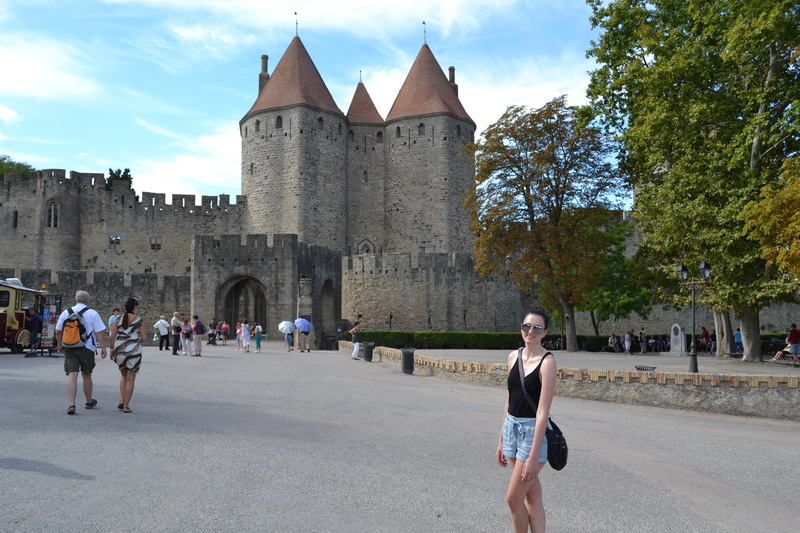 Carcassonne is an old town surrounding a medieval fortress, which is known as ‘Cite de Carcassonne’. The hilltop was apparently first fortified by the Romans sometime around 100BC (I’m still amazed by how old everything is over here – for a bit of reference, that means the origins of Carcassonne are something like 3 times older than the entire known history of people in New Zealand, and more than 8 times more distant in the past than the point where Captain Cook introduced our country to the rest of the world), and was designated a UNESCO site in 1997. So of course it is a beautiful little place, fascinating to look around, but also jammed with knick-knack shops and crowds of tourists. 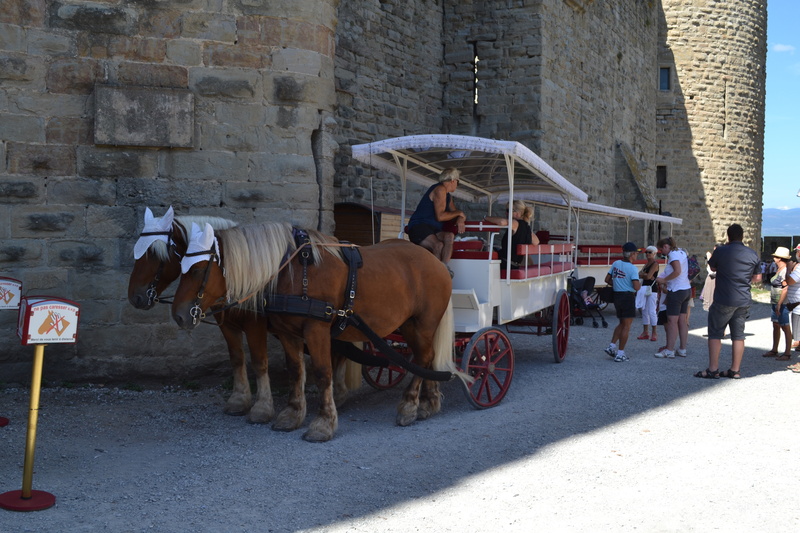 We cruised around for a while (noting that for some reason, all the horses in town are dressed in little white hats) and then left to see something a bit more off the beaten track. 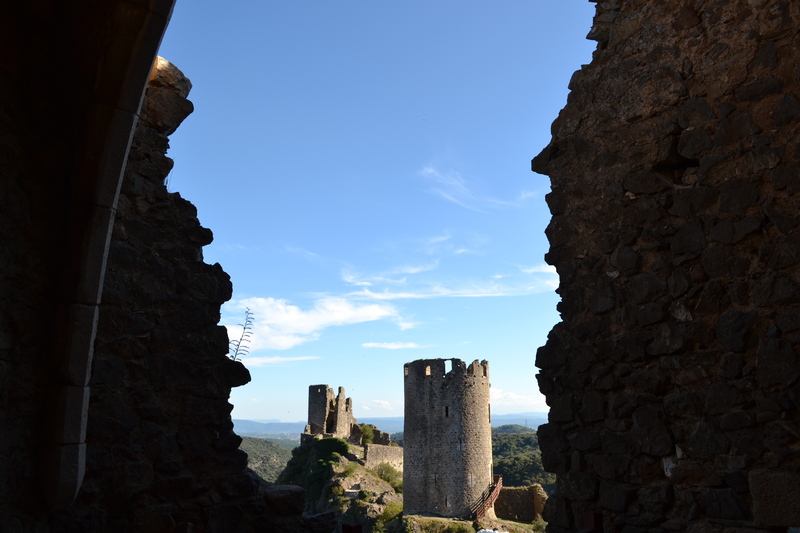 Lastours is set of four ruined castles on a hilltop a short drive from Carcassonne. 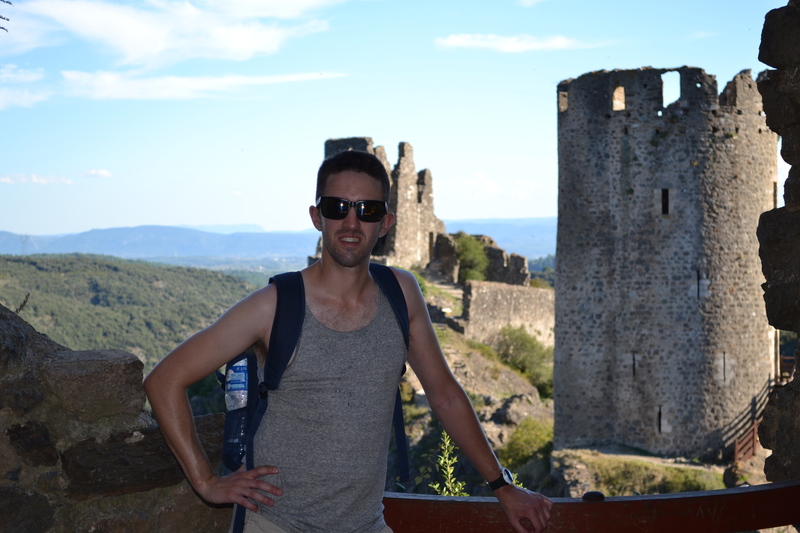 It isn’t actually that off the beaten track (we still had to pay to get in, and the tourist office is very well-appointed), but it was refreshingly empty after Carcassonne. 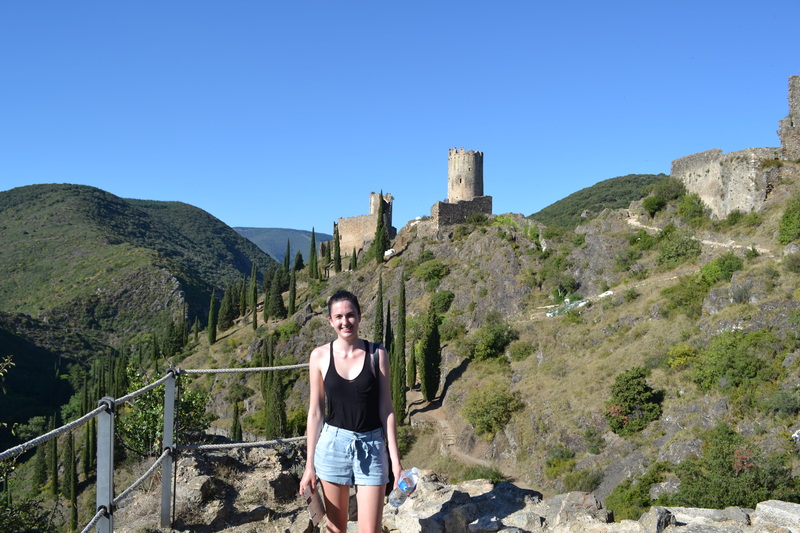 The trail starts at the charming village in the valley below the hill and winds up the hill and around the ruins, and apparently it takes at least two hours to take in everything (according to the nice lady who relieved us of some euros at the tourist office). Thanks to our long legs and a motivation to make it home in time for dinner we did the route in just over an hour, but it was still an amazing walk. 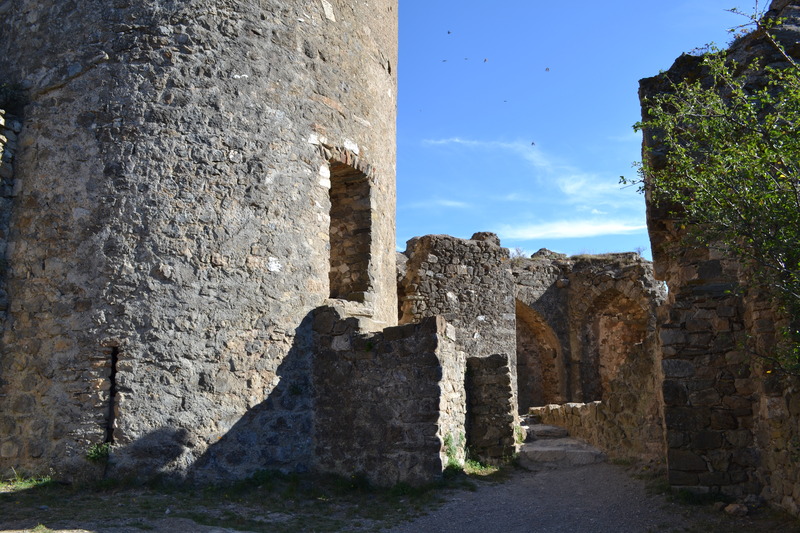 The dilapidation of the castles has been halted but not restored, meaning that while they are ruins they are also all fairly safe to climb on. We squeezed up the claustrophobic corkscrew staircase (it was pitch-black, and the older generations were not large people) to the top of one of the towers to catch the view, and then headed back down to the car to go home for the day. After a nice break from hotels it was time to move on again (thanks for having us family!). 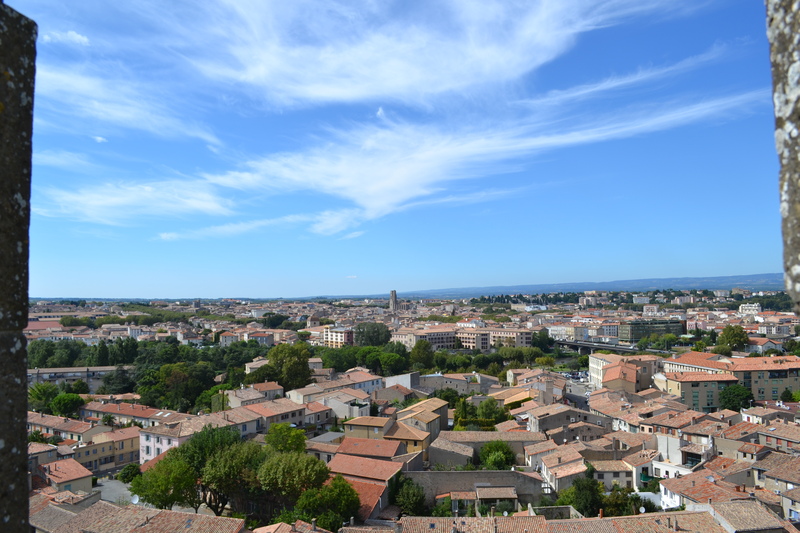 We left fairly promptly in the morning to make a lunch date in Montpelier, and ultimately bound for Avignon. PS – Sorry about the lack of photos in this one, we were a bit slack with the camera.